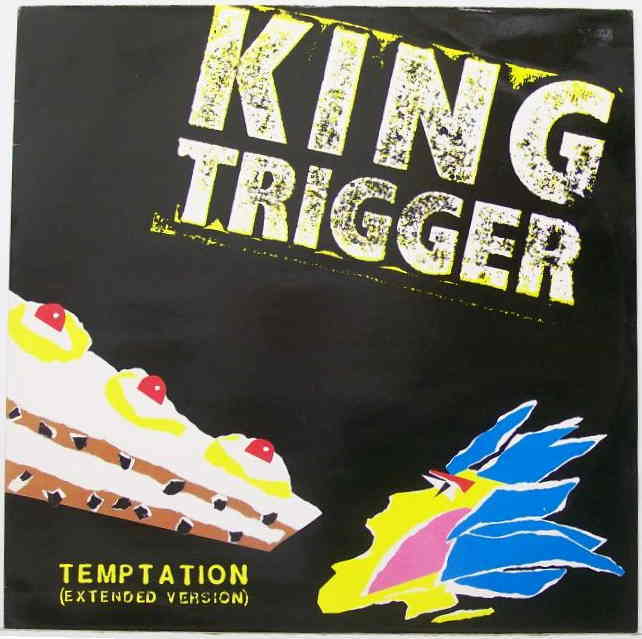 King Trigger were a short-lived British new wave band formed in 1981 out of the ashes of the punk band The Scoop. They combined elements of heavy, percussive African rhythms, post-punk funk and a Bo Diddley beat garnering them some comparisons to peers such as Bow Wow Wow, Pigbag, Adam and the Ants and The Pop Group. They were signed to Chrysalis records and released the EP “Temptation” in 1982 which was produced by Steve Lillywhite, quickly followed by their largest UK hit “River”. The band members were: Trudi Baptiste on piano and vocals; Martyn Clapson on guitar and vocals; Ian Cleverly on percussion; Sam Hodgkin on vocals; Stuart Kennedy on bass and vocals.